The City Council will soon be in its summer schedule of a regular meeting every other week. This week agenda has a number of significant items, including 12 motions from the City Council. Plain-Tanner St. Corridor Redevelopment Plans: Motion by City Councilor Rita Mercier (2/13/28) Requests City Manager provide an update regarding Plain/Tanner Corridor Redevelopment plans including the effect it will have on 168 Plain Street (Lowell Car Wash). The response was prepared by Diane Tradd, Assistant City Manager/Director of Department of Planning and Development. Ms. Tradd wrote that “The Department of Planning and Development (DPD) had a meeting on March 14th with several property owners in the Tanner Street area, including the Lowell Car Wash and Max Levine Company Scrap Metal to talk about the Tanner Street Realignment project.” The realignment calls for the southern end of Tanner Street to shift the intersection with Plain Street east away from the Lowell Connector exchange at Plain Street and into the new signal for the Target and Meadow Brook shopping plaza. Sidewalk Seating/ADA Compliance: Motion by Mayor Bill Samaras Request City Manager instruct proper department to ensure all restaurants with sidewalk seating comply with the 48 inch clearance as required by the American with Disabilities Act. DPW Inventory Management: Motion by City Councilor John Leahy (5/8/2018) Request City Manager work with DPW to develop Best Practices for inventory control as it pertains to land and building in the City. Motion Responded by Jim Donison, Commissioner of Department of Public Works (DPW) writes: “DPW/Lands & Buildings Division maintains a minimal inventory of parts as the availability of supplies from local suppliers/vendors through state contract prices are excellent. ..We have taken this approach as it would be extremely expensive to maintain an inventory of the various expensive parts for the numerous facilities throughout the City. The availability of parts from the suppliers is very good; they either have the parts immediately available or are able to obtain them with a relatively short period of time, i.e. typically one week. List of Non-operational Items and Items in Disrepair Update Motion by City Councilor K. Cirillo (1/9/18) Request City Manager have the DPW Commissioner provide City Council a list of non-operational or disrepair items no later than August 10th, of every year which are vital to our municipal buildings working properly for our Fall-Winter season of 2018. DPW Commission Donison also answered this motion. He informed the Council that the list will be provided in August but he outlined the methodology and data that will be used to comprise this list. Periodic Maintenance of Schools: Motion by Councilor E. Kennedy (11/14/17) Request City Manager instruct the proper department to provide the City Council and the School Committee with the schedule of regular periodic maintenance at all schools in Lowell. This motion was also answered by DPW Commissioner Donison. He mentions that currently maintenance is provided to the schools when requests are submitted through the School system’s Operation and Maintenance Software System. Update on Construction at VFW Highway and Aiken St. Bridge: Motion by Councilor D. Conway (5/8/18) request City Manager provide update on road construction at the VFW Highway Across the street from Top Donut and the Aiken Street Bridge. Motion responded by Jim Donison, DPW Commissioner Sarah Brown, Environmental Officer –DPD. The project was suspended due to the oil and hazardous material found in the soil when the construction began. Currently further tests are taking place. Once the results are gathered and analyzed, the State Department of Transportation will give the go ahead to start removing the soil. The timeline for that is mid-July 2018 and the completion of the project has now been moved to October 2019, a one year delay. Neighborhood Schools: City Solicitor Christine O’Connor provided the memo on this motion and she stated “I write in response to Councilor Mercier’s request that the Law Department explore what steps are necessary to allow children to attend neighborhood schools and obtain a release from the consent decree. This motion has been forwarded to the Superintendent of Schools and the Mayor to request a report and recommendation from the school committee as to whether there is desire to seek such relief and depart from their current busing practices. As soon as I receive their response I will update the Council. Article 97: This motion was also answered by City Solicitor O’Connor: Here is the content of her brief but comprehensive response: “I write in response to Councilor Milinazzo’s request that the Manager take all necessary steps to reinstate the Article 97 restrictions on parks and open space land which had been removed during the Lowell High School/MSBA site selection process. Although the legislation does contain a provision that “if the land transferred…is not developed for school purposes within 5 years …it shall revert to the board of parks…for park, open space or recreation purposes”, the City is planning to formally request a repeal of the Article 97 legislation relative to the previous Cawley Stadium site. However, Option 3 will also require Article 97 relief relative to air rights for the reconstruction and/or repair of two pedestrian walkway bridges that extend over Lucy Larcom Park and the Merrimack Canal. Accordingly, at such time as the new request for Article 97 relief is made of the Massachusetts Legislature, the City will also request the previous “Act Authorizing the City of Lowell to Transfer Park Land for the Construction of a High School” be repealed. INFORMATION REPORTS: Under this agenda item is a memo from City Manager Eileen Donoghue to the City Council informing them that she intends to propose in the $3.3 million in additional to the city funding for the schools this next fiscal year. She outlines where the funds will be targeted; $3 million will go towards capital investments. I am assuming that this proposal is in reaction to what occurred last week at the Sub-Committee meeting. We will need to have a copy of the current rules to compare to what is being suggested. Additionally, there are a couple of Council motions concerning this issue. ORDINANCE: The Council will vote on a new ordinance, this one covering the sale of recreational marijuana. The number of dispensaries will be limited to 5. Councilor D. Conway: Request City Manager explore the feasibility of re-locating our police station to the site of the District Court located on Hurd Street when vacated by State. Councilor R. Elliott: Request City Manager develop a policy and/or designated area to allow citizens to exercise their 1st Amendment rights. Councilor R. Elliott: Request City Manager report on City adopting MGL Property Exemption for Veteran Volunteer Program. Councilor R. Mercier: Request City Manager have Law Department provide an outline of where people are allowed to demonstrate or protest if not in Council Chamber during a Public Meeting and posts signs indicating such. Councilor R. Mercier: Request City Manager have proper department install security cameras on 1st Street as well as address issues of lighting, excess trash, beer bottles and drug paraphernalia. Councilor J. Leahy: Request City Manager have Law Department draft ordinance that would fine utility companies $100 per line after they were notified that such lines were illegally hanging from their pole. Councilor V. Nuon: Request City Manager a report on challenges and successes in relationship between Lowell Career Center and clients of local non-profit who aid in addiction recovery. Councilor V. Nuon: Request City of Lowell continue its support of non-profits that provide services to our residents in need and request City Manager provide periodic reports on progress and advise on how to strengthen results. Councilor V. Nuon: Request City of Lowell join with non-profits to send a letter to the US Senate and House of representatives in support of Comprehensive Addiction Resources Emergency Act (CARE) proposed by Senator Elizabeth Warren and Representative Elijah Cummings to begin treating the Opioid Crisis like the critical public health emergency it is. Councilor V. Nuon /Mayor Samaras: Request City Manager have DPW work with representatives from Roberto Clemente Baseball field to install lighting with a scoreboard on the field and to concession stand in the near future. Councilor V. Nuon /Mayor Samaras: Request City re-establish the Youth Council and/or Commission. 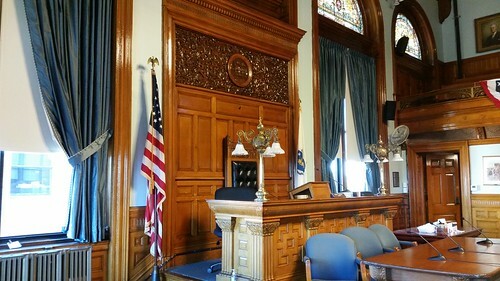 Mayor Samaras: Request City Manager instruct the Law Department to draft a Home Rule Petition to allow the City to appoint retired Lowell Police Officers to work paid detail assignments. I would like to voice my support with Councilor Dave Conway on his motion to have the Lowell Police Department move to the Hurd Street Court House when available. I would also like add that the current police station be used for the new high school expansion.